Mr. Blessing Ebizie holds an MBA in Financial Management from the Lagos State University and has over 20 years’ experience in Accounting, Auditing, Budgeting / Control, as well as Finance and Risk Management functions. His record of service cuts across the Manufacturing, Communications/Logistics and the Financial Services sectors. A Certified Information System Auditor (CISA), Blessing started his career as an Accounts Clerk in the Finance/Accounts Division of Golden Guinea Breweries Plc in 1984. He rose to the position of Cost & Management Accountant in 1997 and became the Head of the Company’s Internal Audit Division in 2000. 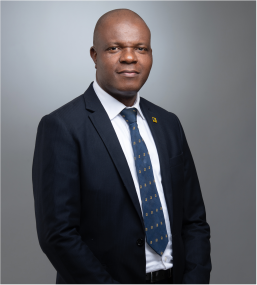 Prior to pitching his tent with FBNInsurance Limited, Mr. Ebizie was the Head of Logistics Division and later General Manager, Finance & Administration of TNT/IAS Int’l Express & Logistics from 2004 to 2005. He is an Associate Member of the Chartered Institute of Taxation of Nigeria and a Fellow of the Institute of Chartered Accountants of Nigeria.